Reduced pressure zone assemblies (RPZ Valves) are extremely important. They’re used to keep contamination or pollution out of your water. 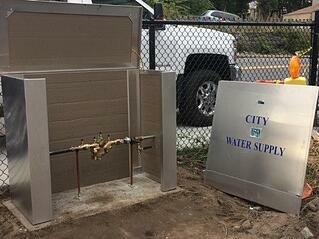 Specifically, this device is installed onto your plumbing system to protect drinking water and the city water supply. Reduced pressure zone devices provide the highest level of protection for your water supply. That’s why most municipalities and engineers across the country are requiring the use of these types of backflow prevention devices. In fact, many areas are now requiring their use on all domestic and fire service lines. So, even if you’re in an area where single checks or double checks with their low hazard level protection was once acceptable, that could change. So, let’s take a look at why reduced pressure zone assemblies are safer and how to install one. WHY IS AN RPZ VALVE BETTER? 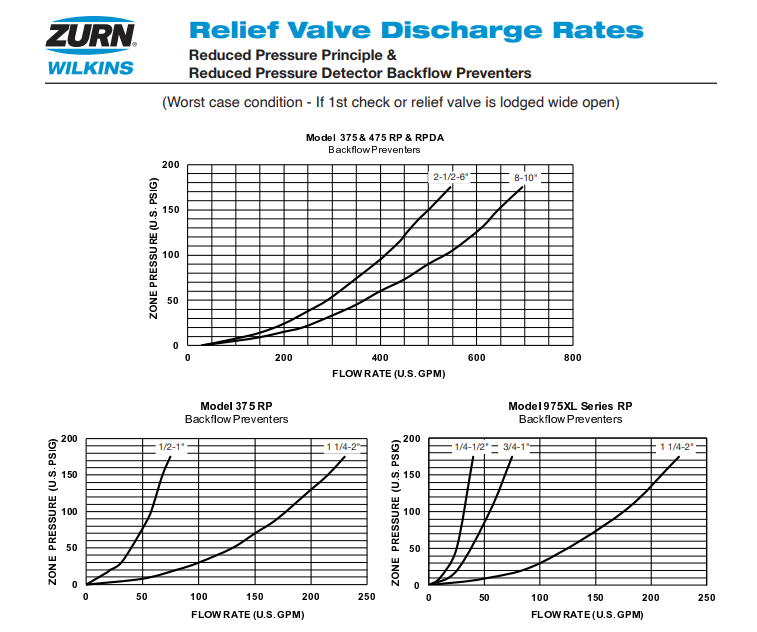 A Reduced Pressure Zone (RPZ) lets you know that the valve is working properly. RPZ backflow preventers consist of two independent check valves. They work like a double-check backflow preventer, but they also have an intermediate relief valve that opens to atmosphere if both check valves should fail. If you walk up to an RPZ and no water is dumping out of the relief valve, then you know that backflow preventer is working properly. If the relief valve is dumping out water, or spitting out small or large amounts of water, then you know that something is not right and maintenance on the valve is required. This peace of mind is what municipalities and engineers are requiring more and more to protect our precious water supply. Backflow preventers work by letting water flow through them in one direction, but prevent water from flowing back through them in a reverse direction. This is how the water supply is protected. A house or business or cyanide plant can use all the water it wants, but once the water has passed through the backflow preventer, it will not be allowed back into the water supply. An RPZ provides the best level of protection because it has a built-in relief valve, which will open up and actually dump the backflowing water out of the valve, in order to prevent any chance of contaminated water re-entering the water supply. You can read the details about the differences between DC and RPZ backflow preventers here. Now that they are becoming so prolific, you may need to know where to install an RPZ valve. You basically have two options: inside in a mechanical room or in an RPZ enclosure. Because an RPZ is designed to dump water, the surrounding area is going to get wet. An RPZ that is dumping water is working exactly how it’s supposed to. Unfortunately, this is not a good situation if the RPZ is installed inside a mechanical room or in a utility closet as the surrounding area will be damaged by the water pouring out of the backflow preventer. Incredibly, these devices are even installed up in the ceiling or attic sometimes. An RPZ will dump water. You can see it for yourself on this video we took of an RPZ enclosure in action. 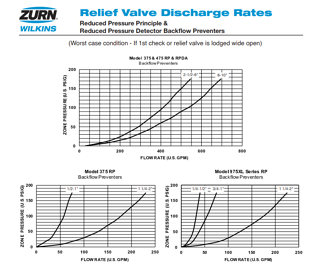 Additionally, if you look at the flow rate chart for a popular backflow preventer manufacturer to the right, you can see that an RPZ can discharge an incredible amount of water in a very short amount of time. The RPZ will absolutely protect your water supply, but if installed in the wrong space, it can potentially destroy your property. It is important to use best practices when installing an RPZ, and the best place for installation is outside in an RPZ enclosure. WHY INSTALL IN A HEATED ENCLOSURE? Enclosures were designed with RPZ installation in mind. ASSE 1060 regulations ensure that backflow enclosure manufacturers are designing their products this way. The ASSE 1060 testing requires that enclosures provide a drain for when the RPZ inevitably dumps water and the drain requirements are strict. For backflow preventers sized 4" and larger, the drain must be able to move 710 gallons per minute. Enclosures made to these standards provide easy access for maintenance and repairs. The materials used for RPZ enclosures are designed to withstand the elements and are tested for structural strength as well as security. An aluminum enclosure is excellent protection against theft and vandalism, not only because of the durability of the enclosure, but also because the device is hidden from view. If an RPZ was to discharge water, enclosures provide visible means to detect it. If the RPZ were inside dumping water, you wouldn't know until someone entered the mechanical room, or until the damage was so great it surpassed the mechanical room. A heated enclosure is the perfect place to install your RPZ, providing your water supply with the highest level of protection, and protecting the surrounding area from water damage. If you need more information or tips on how to design your enclosure, we can help. Download our guide: "5 Design Guidelines and 25 Application Tips." Inside you'll find everything you need to ensure your RPZ valve is installed correctly and provides your water supply maximum protection.